This is a 4.25 inch square card. 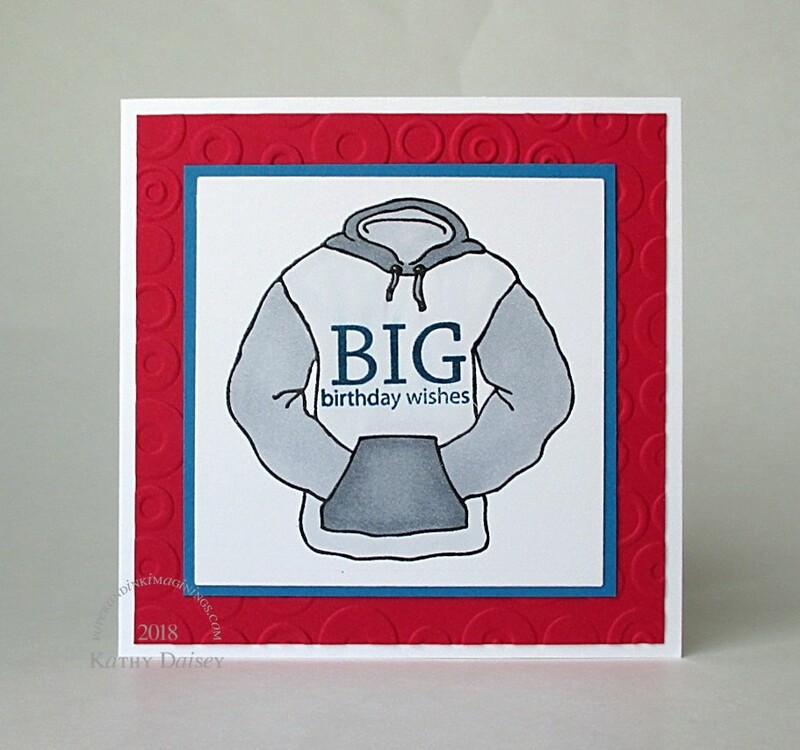 I found the sweatshirt in my scrap folder (already embossed), and added the sentiment. HELP! The VersaFine ink and Ranger super fine embossing powder (used on the new sentiment) were not Copic safe on this specific day!! Did I overheat (and burn off) my embossing powder by accident?? (It really doesn’t look like that happened!) The blue ink ran a bit with the Copic coloring. The effect helps it look like a sweatshirt that was laundered one too many times, so I stayed with it. Supplies: Stamps – Gina K Designs, Papertrey Ink, paper – Neenah Classic Crest Solar White, Stampin’ Up! Real Red, inks – Copic C1, C3, C5, VersaFine Deep Lagoon, Onyx Black, die – Spellbinders, embossing folder – Provo Craft, embossing powder – Filigree Fine Art Powder clear, Ranger Super Fine Detail clear. Categories: birthday, card | Tags: card, Copics, Gina K. Designs, Neenah, Papertrey Ink, Provo Craft, Ranger, Spellbinders, Stampin' Up!, Tsukineko, VersaFine | Permalink.